Picture yourself on a beautiful Beach of Goa with silver sand to swim and surf, white Churches surrounded by green paddy fields and coconut groves, going for a long stroll on a starry night, and somewhere someone is playing a romantic tune on his guitar. That's Goa for you. 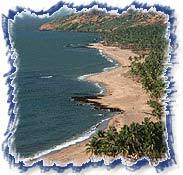 The various places to visit in Goa are: Anjuna Beach, Aguda Fort, Calangute Beach, St Cathedral Church of St. Francis, Bom Jesus Basilica, Dudhsagar Waterfalls, Carambolin Lake. Panaji in Goa still looks and feels like any Portuguese town with grand public buildings and old houses with over-hanging balconies and numerous bars & cafes. 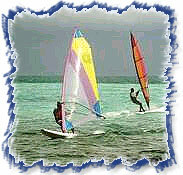 Tourism is the main money-spinner business in Goa. But on the coast, coconut cultivation and fishing are still the main sources of income. Goa Tourism happens all over the year but if you want to enjoy the Carnival better visit in Feb-March. Typical of a Goan town, Panaji is built around a church facing a prominent square. The town has some beautiful Portuguese Baroque style buildings and enchanting old villas. The riverside, speckled with brightly whitewashed houses with wrought iron balconies, offers a fine view. Vasco da Gama, 29-km by road southwest of Panjim, sits on the narrow western tip of the Marmagoa (also known as Mormugao) peninsula, overlooking the mouth of the Zuari River. Acquired by the Portuguese in 1543, this strategically important site was formerly among the busiest ports on India's west coast. It remains a key shipping centre, with container vessels and iron ore barges clogging the choppy river mouth, but holds nothing of interest for visitors, particularly since the completion of the Konkan Railway, when Goa's main railhead shifted from here to Margao. The only conceivable reason one might want to come to Vasco is to catch a bus to Dabolim airport, of Bogmalo beach, 8-km southeast. With its fluorescent painted palm trees and infamous full moon parties, ANJUNA, 8-km west of Mapusa, is Goa at its most "alternative". Designer leather and lycra may have superseded cotton Kaftans, but most people's reasons for coming are the same as they were in the 1970s: dancing and lying on the beach slurping tropical fruit. While browsing in the area have a day trip to the famous flea market. Baga, 10-km west of Mapusa, is basically an extension of Calangute; even the locals are unable to decide where ends and the other begin. Lying in the lee of a rocky, wooded headland, the only difference between this far northern end of the beach and its more congested centre is that the scenery here is marginally more varied and picturesque. "A Topping On Tourist Pie"
A mere 45 minute bus ride up the coast from the capital, Calangute is Goa's busiest and most commercialized resort, and the flagship of the state government's bid for a bigger slice of India's package-tourist pie. In the 1970s and early 1980s, this once peaceful fishing Village epitomized Goa's reputation as a haven for hedonistic hippies. The Portuguese Viceroy Redondo commissioned the Se, or St. Catherine's' Cathedral, southwest of St. Cajetan's, to be "a grandiose church worthy of the wealth, power and fame of the Portuguese who dominated the seas from the Atlantic to the Pacific". Today it stands larger than any church in Portugal, although it was beset by problems, not least a lack of funds and Portugal's temporary loss of independence to Spain. It took eighty years to build and was not consecrated until 1640. 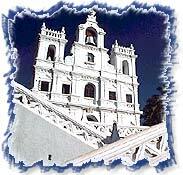 This is the largest church among the group of churches in Old Goa. Built on a raised plinth of laterite, covered over with lime plaster, the church has, besides the main altar, eight chapels alongside the aisles and six altars in the transept. Just off the coast of Kerala are a widely scattered group of coral islands - 36 of them - collectively known as Lakshadweep. 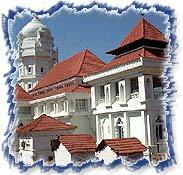 They form part of the Union of India and are one of the country's newest tourist destinations. Ten of the islands are inhabited by simple, peace-loving folk whose language is close to that spoken in Kerala. The islanders have lifestyles and occupations that revolve around coconut cultivation, coir matting and fishing. Even today, nothing is actually produced in the islands themselves, and everything comes from the 'mainland', as India is somewhat quaintly referred to there.